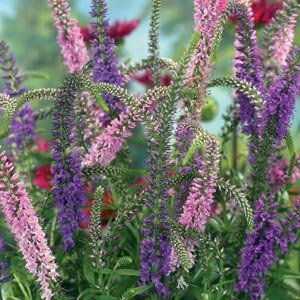 Veronicas are strong bloomers, which makes them a popular choice for gardeners! The plant produces brightly colored flower “spikes” that are very attractive to hummingbirds, butterflies and bees. Perfect as a groundcover or even a container plant. Enjoy these unique blooms all summer long! The Sightseeing Veronica produces a blend of white, pink and blue blooms that will definitely catch your eye in any garden.